One evening, Dr. Dyer and his wife were having dinner in a restaurant with their friends, Bonnie and Jeff. Dr. Dyer was telling them about an invisible power that can manifest and attract anything you want. They rolled their eyes. She meant right then and there in the restaurant. *You'll find a complete explanation of how Wayne Dyer learned this meditation technique (in the ancient Tamil Siddha tradition of southern India) from Shri Guruji on Session 2 of Dr. Dyer's program. At the tournament in Las Vegas, Bonnie and Jeff, and the other 700 participants, were each assigned to a slot machine. For the next three days Bonnie and Jeff played their machines, meditating all the while. They had never won anything before in their lives. But this time they won $27,000. On their return, Jeff, who's a builder in south Florida, and who had been going through some tough times lately, continued the meditation practice. His luck soon improved. He won a bid to build 200 homes — the largest project he had ever received. His income quadrupled. His number of employees tripled. A couple of days ago, when he was speaking in Lily Dale, NY, where he taught this very same manifesting technique a year ago, five or six people came up on the stage and talked about what they had done since hearing his previous speech. One woman had manifested herself a bookstore that she had always wanted to own. Without any money, and no down payment, she was now running a profitable business. Another woman told him that she had been trying to sell her house in Colorado for two years. When she started doing the meditation, within one week she had four people look at it, received an offer, and sold it. Don't take offense, but I've got to ask you this question: Are you satisfied with your life? Is it exactly the way you wish it were? If you knew that the next 10 years would be more of the same, would you look forward to them with enthusiasm? Or do you have something else in mind? ... use the power to attract a better job, create your own business, or break the mold and start a new career — one you've always dreamed of. Or, move to the place of your dreams and live the life you've always longed for. ... financial independence, a gorgeous house with a view of the ocean or mountains, with rooms full of beautiful furniture and works of art. You can, if you want. You'll be amazed as this power helps release you from worrying about what others think. You'll discover the joy of answering to yourself — being completely free to be spontaneous and do whatever you want, whenever you wish. ... you'll live in harmony with everyone; people will be attracted to you; you'll experience more love and joy with your family and friends; forgiveness will come easily; and you'll build a satisfying and more mutually nurturing bond with your partner. … who's at peace, self-actualized, and satisfied with his or her life. You'll know what it means to live problem-free and experience boundless bliss. You'll feel uplifted and truly inspired from the moment you wake in the morning to the moment you go to sleep at night. ... help others. Your hands will have the ability to heal. You'll ease people's pain and suffering, help the less fortunate and downtrodden, and use your energies to aid worthy causes — making the world a better place. But only because you do not yet possess this power! I'm going to prove to you that this power is real — and that you can make everything that I just mentioned come true. Wayne Dyer is remarkable. He's had an uphill battle from day one. After starting life as an orphan, being bounced from one foster home to another, he has become a successful psychotherapist and world-renowned leader in the field of self-development. He is the author of the bestsellers Your Erroneous Zones, Pulling Your Own Strings, and You'll See It When You Believe It. Wayne has appeared on Oprah, The Today Show, and The Tonight Show. Here at Nightingale-Conant, Wayne's audio programs — Freedom Through Higher Awareness, How to Be a No-Limit Person, The Awakened Life, Real Magic, Applying the Wisdom of the Ages and more — have been some of our most popular programs. Each program of his opens a new door to a higher wisdom — unlocking mysteries that mankind has puzzled over since the beginning of time. And that brings me to the reason why I'm writing to you. I believe that you can benefit from some of our audio programs — especially the one from Wayne Dyer that's featured in this report. Let me tell you about this exciting program. It really is one of my all-time favorites. YES, I want to learn more about the divine power that will enable me to easily manifest and attract whatever I desire into my life! As chairman of Nightingale-Conant, one of my functions is to review all proposed manuscripts for new programs. One evening I arrived home from work with a briefcase full of paperwork and reading material. At 9 o'clock I dragged myself into my study, looked at my briefcase, and groaned. I wasn't in the mood to work. So, instead of diving into it right away, I decided to sit down and meditate. After meditating a few minutes, I stood up, went to my desk, and put my briefcase on the floor to my right. I opened it and grabbed the handful of papers. Staring at me was a thick manuscript with a Post-it® note from Georgene, one of my producers, which said, "New proposal from Dyer. Looks great. Your comments, please." I sighed. It was late and it looked like too big a task. "Do I really have to read it?" I thought. Dyer's stuff is good, and I trust Georgene's judgment. No need to read it, I decided. I grabbed the manuscript with my right hand and turned to put it back into my briefcase. But something odd happened. My arm was stuck — frozen in mid-air — suspended above my briefcase — and wouldn't move. Did I have a kink in my shoulder? Was it a muscle spasm? Is this how a stroke starts? I pushed harder. But my arm wouldn't move. Since I didn't feel any pain, I didn't panic. I relaxed my arm. And as soon as I did, I watched in amazement as my arm moved by itself, back toward my desk, placing the manuscript in front of me. Did you ever wonder how Jesus turned water into wine? In a moment I'll explain the secret of how miracles are performed and how you can use this divine power — which is already inside you, just waiting to be used — to manifest your destiny. Dr. Dyer's manuscript was a captivating eye-opener. It was this very same power that moved my arm — stopping me from putting the manuscript back in the briefcase and moving it back in front of me. There was an invisible flow of energy from my thoughts directly to the manuscript — and the same invisible flow of energy from the manuscript to my thoughts. Before I reveal how miracles work — let me finish my story. As you can imagine, I gave the manuscript an enthusiastic go-ahead. 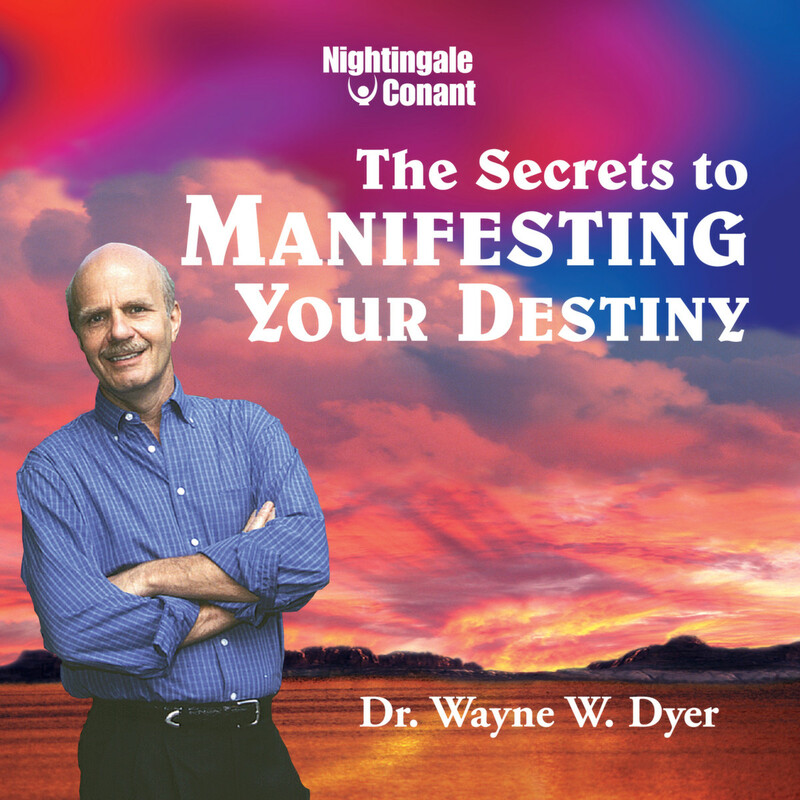 Shortly after, we invited Dr. Dyer to Chicago to record his breakthrough audio program The Secrets to Manifesting Your Destiny, before a live audience. Picture a remote control and a TV set. Now, imagine yourself sitting across the room from your TV. You want it to turn on, so you press a button on the remote control and, presto, a picture appears. When you want to change the channel, you press a button, and the picture changes. But where are the wires that connect the remote control and your TV? There are none. Is it magic? Of course not. Even if you don't understand the technology, you know that there's an invisible infrared beam sending a signal to your TV. Your mind works the same way. Thoughts are nothing more than signals of energy. You can send a thought to your hand, but does it end at your fingertips? Just because you can't see wires extending from your hand, does it mean that the signal stops? Your thoughts extend beyond your physical body. They flow as waves. Another word for waves is frequencies. Just as radio waves have different frequencies, so do your thoughts. Don't worry; this isn't going to be too technical. Please bear with me just a little longer. One level of thought frequency tells your arm to rise. A higher frequency creates a sandwich. An even higher frequency level composes a beautiful symphony. You can't see the thoughts, but you can witness their results. You see your arm move; you taste the sandwich; and you hear the music. But there's an even higher frequency level — a level of energy on which all matter is created. It's on this level that Dr. Dyer has made his remarkable discovery. Now comes the interesting part. How do you tap into this higher frequency? Where is this divine power? What enables you to access it? As sages have known for thousands of years, there is only one way to do it. This power already resides inside you. All you have to do is unleash it. And how do you unleash it? Simple, you get in touch with your higher self — the part of you that exists beyond your ego. Has this happened to you? You find yourself thinking of someone whom you haven't thought of in many years... then suddenly, out of the blue, the phone rings and it's that person? But that's nothing. Just imagine what you can do with this power when you learn to tap into it. Suppose you're dreaming of moving across the country and finding a new job. Suddenly the phone rings and the conversation goes something like this: "Hi, you may not remember me... but we met a couple years ago and something's come up, and for some strange reason I thought of you because you'd be perfect for it... and I thought I'd give you a call to see if you're interested..."
As you listen, you pinch yourself. This person is calling from the other side of the country — from the exact place you want to move to — and is offering you a job that is right up your alley. A coincidence? A once-in-a-lifetime occurrence that can never be repeated? Let me show you how you can easily tap into this power and use it to manifest and attract what you want. Please accept my invitation to listen to Dr. Dyer's The Secrets to Manifesting Your Destiny. You have to love what you hear; otherwise I wouldn't expect you to keep it. And what exactly will you hear? You'll hear Dr. Dyer describe this amazing power of manifestation — what it is, how it works, and how you can harness it and use it to help you. Dr. Dyer's material is recorded on six CDs. On Sessions 1 & 2, Dr. Dyer starts with an overview of the power to manifest and then introduces the 9 Principles of Manifestation. Then, in the next nine sessions (Sessions 3 to 11), Dr. Dyer takes you through each of these 9 Principles — devoting one session to each principle — which, to me, is the truly eye-opening portion of the program. Each one of the 9 Principles fills in an important missing piece in your understanding of what life is all about, what keeps you from living the life you really want, and how to set yourself free to experience the abundance that is out there waiting for you. You'll learn how to trust your divine inner wisdom and honor your worthiness to receive this gift. You'll discover how to connect yourself to the energy source that enables you to attract what you want. In your relationships, you'll learn the secret of unconditional love. And, you'll find yourself suddenly free to enjoy a level of bliss that until now you've rarely felt. The 9th Principle reveals the sound of creation. After studying the religions of the worlds, Dr. Dyer stumbled upon one sound that is common to all. It's this sound, when performed as Dr. Dyer describes, that unlocks the power to manifest. Session 12 is the climax. It's at this point that Dr. Dyer talks you through the 20-minute meditation technique that awakens this power. As he points out, you can even do this meditation when you're driving your car or taking a walk. There are two meditations — one for the morning and one for the evening. They are identical except for the sound that you make. The morning sound wakes you up and energizes your body; the evening sound rests you and prepares you for a deeper sleep. There's a bonus audio session, "Dr. Dyer's Quick Action Steps for Realizing Your True Destiny," included at no extra charge. If you believe in a higher power, if you're interested in improving your life, then click on the link below, and we'll rush you the audio program right away. YES! I want to learn more about the divine power that will enable me to easily manifest and attract whatever I desire into my life! Please send me The Secrets to Manifesting Your Destiny — I can select one of two ways of ordering. "When I was in high school, my parents would not even discuss the possibility of me going on to college. My father disliked people that 'have big ideas.' So I got married before I graduated from school and was raising two sons by the time I turned 20 years old. "Then I purchased your [CD] set. I listened to it while sewing quilts or ironing shirts. I knew then that I could do much more than just cook or sew. I knew that I did not have to stay poor and uneducated, even though several of my in-laws shunned me because I was 'too fancy' for them. Finally, I convinced my husband to leave his parents' ranch and his low-paying job and move to Boise, Idaho, so I could attend college. "Since that time about 15 years ago, I have read your books and listened to more of the [CD] sets. I completed college and passed all parts of the Uniform CPA Exam in one sitting. I have held jobs with the State of Idaho and a small CPA firm. Currently, I have my own CPA practice and work out of an office in my home. "My greatest accomplishment (so far) was last November when I spoke to a college class on what it takes to be a CPA, what the advantages are, and some of the things I've learned that might help them in their careers. As I was leaving, one professor asked if I would like to teach his advanced accounting class while he's on sabbatical. Now, I'm doing it. "Thank you so much for helping me to believe I can do it!" "After 22 years of marriage, I can truly say I love this man and he loves me. And I thank you! "Last year I was ready to walk out of the marriage because all I did was focus on my husband's faults. Through continuous listening to your [CDs] and following your suggestions — our marriage is stronger than it has ever been. I now work toward harmony and love rather than finding fault and encouraging arguments. I don't want to argue any more — it used to be my favorite pastime. YOU have taught me to look through another pair of glasses and I am now loving life! "You have truly brought joy into my life that I have never experienced in my 49 years. I'll continue to listen to your messages and follow your suggestions. With love and health,"
"What can I say? The student was ready and the teacher appeared! Your [CDs] have freed me up in many ways. One example is that I had suffered from panic disorder for 10 years. After a daily dose of your wit and wisdom for several months, I began to overcome the disorder. After a little more than a year, I was in 99% remission. I want to thank you for delivering your message in such a way that it can be easily internalized."